Olympus Multiphoton FV MPE RS Apollo System: With the Olympus FVMPE-RS, countless possibilities for deep tissue observation are finally realized. The system delivers unmatched high-speed imaging, essential for capturing the dynamic in vivo response, with fine laser control pinpointing the precise site for optimum excitation efficiency — even deep within the sample. Accompanied by high S/N-ratio imaging and dedicated Olympus multiphoton objectives, efficient detection of scattered fluorescence photons is also ensured. In essence, the Olympus FLUOVIEW FVMPE-RS unites high-speed, deep observation capability with multicolor imaging and powerful laser light stimulation, offering a no compromise solution to answer innovative biological research questions. The upright microscope is coupled with a Spectra Physics Insight DeepSee laser with dual pulsed laser lines (1040 nm, and 700-1300 tunable). 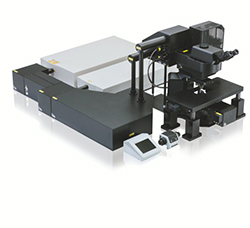 The system contains galvometer-based scanner for high resolution imaging, a SIM scanner for uncaging and a resonant scanner for high speed imaging applications. Zeiss LSM 710 Confocal: The LSM 710 is an inverted confocal microscope equipped to handle all your fixed tissue imaging needs. A confocal uses point illumination to help overcome some of the limitations of traditional wide-field fluorescence microscopes, including improved optical resolution at depth, decreased background fluorescence and thin optical sectioning for 3D reconstructions. It can collect transmitted light images (bright field and DIC), as well as conventional and confocal fluorescence images. The microscope is a top of the line spectral point scanner equipped with six laser lines for excitation at 405 nm, 458 nm, 488 nm, 514 nm, 561 nm and 633 nm and the HAL 100 halogen illuminator and can collect bright field and DIC images, as well. The unit has 10X EC Plan neofluar, 20X Apochromat, 40X EC Plan neofluar, 63X Apochromat and 100X oil Plan Apochromat objectives. Image acquisition and analysis is via the Zeiss Zen 2009 LE software platform. Zeiss AXIO Imager M2 upright widefield fluorescent microscope: This is a fully upright motorized microscope including motorized stage that allows slide scanning (tiling) and acquisition of Z-stacks. 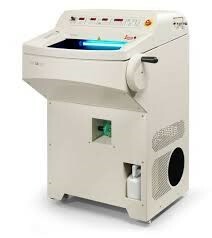 The instrument is equipped with 4 filters that detect DAPI, GFP/488, Cy3 and Cy5 wavelengths. 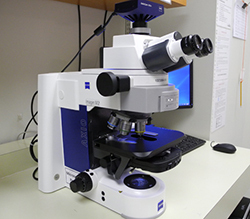 An Axiocam 105 digital color camera and a high resolution Axiocam 506 digital monochrome camera are installed on the microscope allowing acquisition of either color or monochrome images. Zen Image analysis software that includes deconvolution, colocalization and extended depth of focus is available on the instrument workstation and on a second workstation dedicated to image processing. Zeiss AXIO Imager A2 upright widefield fluorescent microscope: This is a non-motorized microscope equipped with filters that detect DAPI, GFP/488, 594 wavelengths. 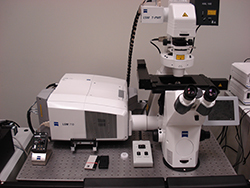 An Axiocam MRc5 color camera is installed on the microscope allowing acquisition of either color or monochrome images. Available for tissue-thin sectioning. UVC disinfection minimizes risk of contamination by infectious material. AgProtect, an antimicrobial, nanosilver coating on all outside surfaces also minimizes contamination risk. High specimen stability is achieved by adherence to deeply grooved specimen discs. Specimens freeze quickly because the pre-cooled discs feature a large back surface that fully contacts the freezing shelf with integrated Peltier element. NeuroLeucida and Stereo Investigator from MBF Bioscience. Installed on a Zeiss Axio Skop upright microscope with a motorized stage and fluorescent capabilities, Neuroleucida allows accurate reconstruction of cells permitting detailed morphometric analyses and 3D mapping. Stereo Investigator allows for unbiased estimates of the number, length, area, and volume of cells or biological structures in a tissue specimen. Available to aid in affixing cell preparations to glass slides prior to imaging, and is able to processes 12 specimens at one time. The cytocentrifuge deposits cells onto a clearly defined area of a glass slide and constructively flattens cells for excellent nuclear presentation. 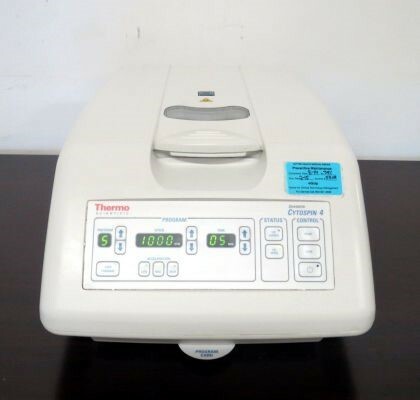 During operation, the instrument's spinning action tilts the Shandon Cytofunnels upright and centrifuges cells onto the deposition area of the slide, giving all cell types equal opportunity for presentation. Dedicated Computer Workstations: Two workstations are available for post-acquisition processing of images. One workstation has Zen Pro image analysis software that includes deconvolution, colocalization and extended depth of focus. Another Workstation has Bitplane Imaris software (v 8.02) for quantitation and 3D rendering.